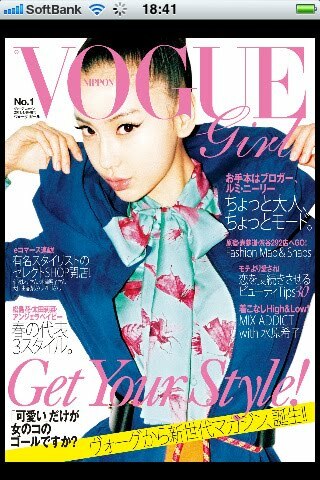 Vogue Girl Japan No.1 – out now! I can’t remember if I mentioned it, but not long ago I was part of the two-person team which translated Vogue Girl Japan’s iPhone app into English. Anyway, the app is out now, so go wild and crazy and download it and get the warm fuzzies knowing that you are helping this sometime-translator to keep living the dream. Ha ha. ← Play with your food – or wear it! Vogue Girl? Why are Japanese women so willing to be infantilised? No no, Gail, although I agree with your sentiment to a degree*, this is FOR girls. ie, it's the Japanese equivalent of Teen Vogue. *this is a topic that would be waaaay too long for one blog post!! Awesome! If I had an iPhone, I would have downloaded it! But, if only. Yep, I don't have an iPhone either, that's why I have to get everyone else to downoad it instead! OOoo I'll have to check out the app!!! Was nice meeting you too lovely 🙂 XXXthe sydney girlp.s. Would love to add you to my blogger email address list! Do you have an email address?